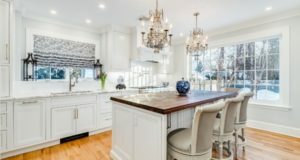 The appeal of your kitchen can really make or break a property sale, according to online real estate giant Trulia and countless other property experts. As a hub of the home, it is where you spend time with family, welcome guests and the place where prospective buyers will carry out their closest inspections. 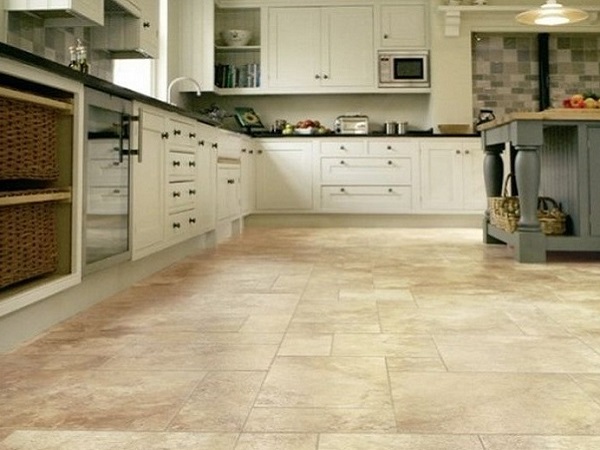 If you’re looking for a way to revamp a lacklustre kitchen, then start by looking at your flooring. This is a key design element and a new floor can really give the whole room a lift. However, with such a wide range of options available, it can be difficult to know which material to pick. 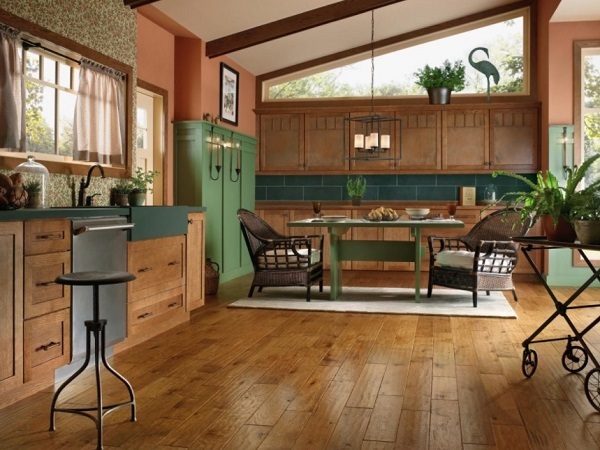 Here are four options for your next kitchen flooring project. If you have pets or children, then laminate is a great choice for your kitchen floor. The top layer is extremely durable and can withstand spillages, scratches and the general wear and tear of a busy household. Laminate is also extremely cost-effective and easy to install. You can add a soft cushioned layer beneath the laminate for extra comfort. Choose a laminate product with a long manufacturer guarantee – many go up to 25 years. Traditional wood is top of the list for many homeowners, due to its classic and authentic look that adds a real touch of quality to any room in the house. However, when installed in the kitchen, wood needs to be treated carefully so that it doesn’t pick up water marks or become warped. To clean, use a hardwood floor vacuum across your kitchen floor, mop, then buff the floor. Periodically though, you will need to varnish and reseal the wood to help it retain its quality. If this sounds like too much maintenance for you then you may want to consider a different option. Vinyl has come a long way since the old ‘lino’ designs of the 1970s. Vinyl now comes in large floor tiles that simply click into place leaving barely any trace of an edge. It is incredibly water resistant which means you can rely on it retaining its look even if your washing machine suffers a leak. Vinyl is inexpensive and comes in a wide range of patterns including those that mimic stone and wood. 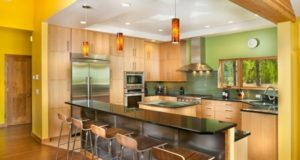 Stone is another material that screams quality when you install it in your kitchen, but as a result this does usually mean a more expensive price tag. 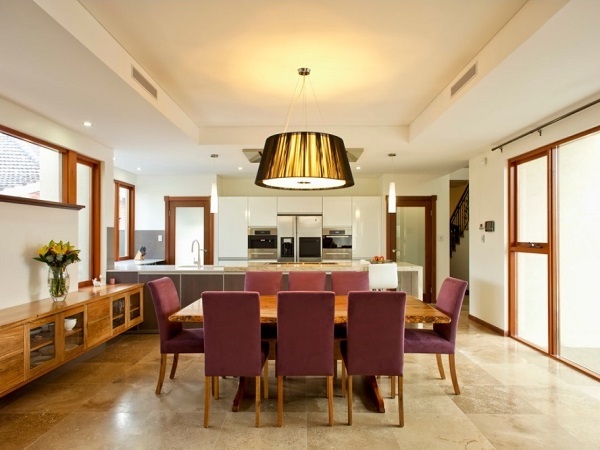 The natural tones of marble, slate or travertine will go with any type of design scheme. Stone has a cooler feel to it, so is ideal for warmer climates, but also works well with underfloor heating if you prefer a little warmth beneath your feet. It is simple to wipe clean, making it perfect if you have kids and pets running in and out. 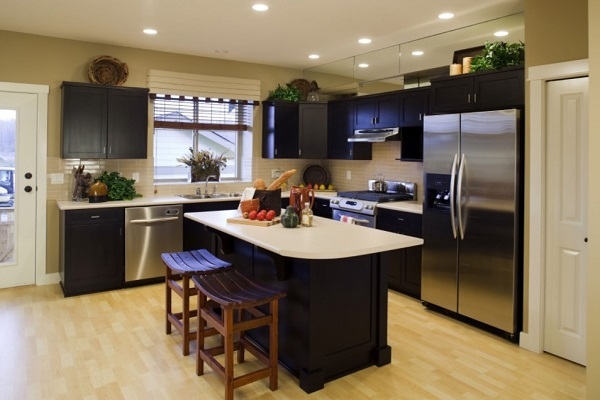 If you’re still undecided, begin by thinking about what your priorities are for your kitchen. Who lives in your household and how much maintenance is likely to be required? Are you looking to give your kitchen a quick revamp before putting it on the market or do you want to stay in this property for a while longer? Once you’ve figured all this out, then grab some samples and turn your kitchen flooring ideas into reality.